My journey through the virtual world: How the #vCommunity changed everything! How the #vCommunity changed everything! In the first quarter of 2018, I made the decision to pursue VMware certifications, and eventually land a Virtual Machine (VM) administrator role. My search for a well of knowledge led me to use my existing twitter account (@vGonzilla) where I queried "VMware" in the search bar looking for people who I could connect with. 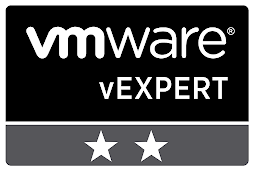 The search resulted in a lot of people who were either #vExperts, had their VMware Certified Professional (VCP) or VMware Certified Advance Processional (VCAP) in various VMware disciplines. I was intrigued, I soon began to purge my account of frivolous and unimportant things I was following and replace them with people who I could reach out too and ask questions. Upon following these folks, I noticed their tweets had a hastag "#vCommunity" in them. I thought, what is that. So, I searched the #vCommunity hastag, and found more folks in the VMware ecosystem. There I met two (2) awesome resources who reached out to me on the spot. Here is where my life changed in an instant. Yup you guess it, I met Ariel (Ah-ri-el) Sanchez Mora (@arielsanchezmor) and Wisconsin's finest, Tony Reeves (a.k.a Mr. vSAN) (@importcarguy). Tony reached out to me one day via a Zoom meeting and introduced himself and talk VMware. I was amazed how a complete stranger, (a stranger no more) would reach out to someone they don't even know and help me out with my lab. At the time, I was struggling with configuring and applying my licenses, acquired through the VMUG Advantage membership to my vCenter. In the Zoom meeting, Tony set me straight and my lab was up and running. I haven't told Tony this, but I was super nervous during the meeting. I felt star struck and tried my best to keep my composure. Since our introductory meeting, Tony and I have had others but the feeling remains with me. I know Tony is a down to earth guy, and his motive are pure but I couldn't fandom the though. On a personal level, I've never experience that type of genuineness in my career before, academically and job-wise. I've always been self-motivated and pushed through even on days where I just wanted to give up. I was blown away having someone help me out without seeking anything in return. Tony, Thank You!. Look forward to meeting you in-person, someday. Ariel, wow! what can I say about this guy. This dude is a great contributor to the #vCommunity, I had the pleasure of meeting for the first time at the Denver UserCon. However, before the event, Ariel and I hung out at my home, where I knew I would hit it off with him. See Ariel is Costa Rican, I married a Costa Rican, BOOM!, instant connection. My wife Gina cooked typical Costa Rican dishes for my man Ariel. Sopita Negra (Literal translation folks, sorry Black Soup), it's a black bean soup cooked and served with a hard-boiled egg, cilantro, and dice onions. Also, every Costa Rican's favorite. Arroz con Pollo (Chicken and Rice). 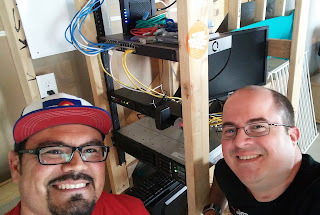 Ariel and I had a great time, he met my entire family, we talked vSAN and vSAN accessories, and I got to show off my homelab. The next day was UserCon. I didn't know what to expect because it was my first one. Last year, I didn't know VMUG even existed and here I am, attending my first ever UserCon. It was at this VMUG meeting, where my eyes where opened to what these events really where about and how they were ran. It was great, the keynote was cool, the breakout session were sweet as well. People in the community call them Mini-VMworlds, and I see why (A future goal). UserCon was a neat experience, I met a lot of folks there, networked with people in my area, met Matt Heldstab (@mattheldstab) who I must thank. He encouraged me to start blogging. Thanks Matt, the #vCommunity at work. You meet a lot of people once you put yourself out there. It's great, because I wasn't (past-tense) :) use to it. I was never the person to reach outside of my circles, the grade-school person in me wouldn't let me. While chatting with Ariel, he introduced me to Scott Seifert (@vscottseifert) the local leader here in Denver. The conversation between Scott and I began to flow, when suddenly. "Hey Scott, you know what. I heard you were looking for new leaders to help. Tony is interested and would be a great fit"...Thanks Ariel. In my mind, I was like, ahh what. I just learned what a VMUG is and now you want me to co-lead it.. Again the #vCommunity at work. Long story short, Scott and I exchanged numbers, we got together after UserCon at a local brewery and now I can officially say, I am a Co-leader at my local VMUG. Hope I don't disappoint, still learning folks. Looking forward to serving the Denver VMUG. Gracias Ariel, eres Pura Vida! I want to end with this, with all the activity surrounding the #vCommunity, it feels like drinking out of a fire hose. But none of this would have never happened, if I didn't put myself out there. Surround yourself with smart'er, fun'er, and cool'er people. The #vCommunity is full of these folks. I found them, and so can you. Thanks for the tip Colin and for reading this post. Fantastic read and congrats on the blog launch. Keep up the great lab work and networking!